To meet the variegated demands of the customers, we are indulged in offering Quartz Rod. This Quartz Rod is made by using excellent quality raw material which we buy from our dependable sources. Furthermore, our product range is checked for quality under various set norms of the industry. 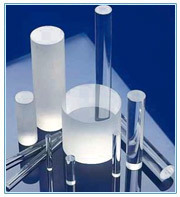 we supply quartz rod from 3 mm to 25 mm diameter as per customers requirement. The strength and purity of Momentive 214 grade quartz rods make them an excellent candidate to consider for fiber-optic applications. Available from 1mm to 45mm in diameter or even greater, Momentive's fiber-optic quartz rods come in a range to suit your specific needs.